For the La Défense project (1991), OMA invited Hans Kolhoff, Jacques Lucan and Fritz Neumeyer to work with them. A parallel can be made between this project and New York Délire. La Défense, which raises the issue of the extension of the axis, is based on a system of ripping out and redistributing urban locations based on an underlying organizational grid like the one in Manhattan. The principle of the urban grid has actually been perpetuated over several centuries, running through movements of destruction and reconstruction, without ever having been called into question or reorganized. In this way, the grid constitutes “a system of memory of unequalled rigour” in the words of Hubert Damisch, at the root of the functioning of the articulated systems in La Défense. “We regard La Défense (the territory of the EPAD) as a strategic reserve which first of all guarantees that Paris will remain intact, but which also represents a special zone of expansion endowed with considerable potential for adaptation. 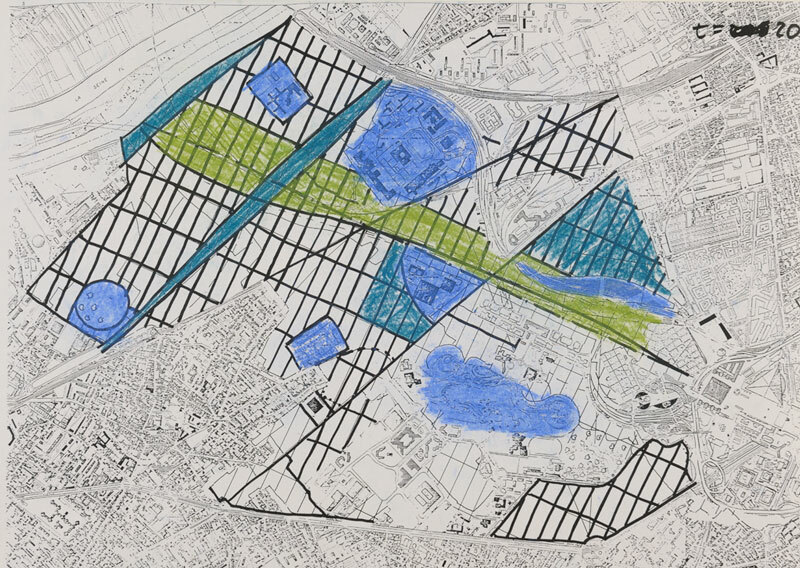 […] We interpreted the idea of extension as the “gradual and progressive transformation” of a system, of a series of systems, into the “system” of La Défense. […] Existing modernity becomes an invisible clean slate. This effect of renewal can be included in a classic tradition of construction, deconstruction, reconstruction. […] Using the terrain available today, we analyzed what the “additional availabilities” would be over five-year periods, and thus discovered a gigantic territory that is theoretically available. We then proposed that “the system of La Défense” should be conceptually extended over this new field, which will be provided for by infrastructures to come: motorways, high-speed trains, etc. The grid proposed here involves both the register of notion and of operation; by not subscribing to the absoluteness of its extension, however, it will form a filter which will isolate some of the elements whose right of survival is not disputed—Nanterre, the university, the prefecture, the park, etc.—and on the other hand, it will suggest the most effective orientations for an urban future” (Rem Koolhaas).